You may have noticed that we recently launched some new functionality on the site. In the past when you wanted to map yourself you had, essentially, two options for describing that place. If you had some way of finding out the latitude and longitude for where you were you could give us that, or you could create a “favourite” which would give you a nice handy label to use instead and let you give a small description of where you were. We thought the favourites were a good way to attach something small and memorable to your location and make it really easy to map yourself wherever you are in the world by using Twitter, web or even DNS. If you didn’t have a favourite created in advance though it could be quite difficult to log your location if you didn’t have a GPS device or something similar though. We’ve now taken a big step towards making it easier to map yourself, whether you’re in the office, in the pub or in any of millions of places around the world by introducing “Place based” locating to mapme.at. So, what does this mean? On Wednesday we pushed out an update to the site that gives you access to a huge database of places of interest. If you go to your homepage you’ll now see not just your favourites showing up but also other places from our database. These places will be listed on the left hand side under your favourites. They’re also displayed on the map as subtle little dots. Click on one of the places, either on the map or the text on the left to open up the place and map yourself there. You can also mark any of these places as a favourite by clicking on the star in the left hand side, optionally giving it a label, and clicking save. Don’t worry about your existing favourites, these have all been converted to private “places” and we’ve marked them as your favourites. By default your homepage will centre on the last place that you mapped yourself to but if you’ve moved on from there you can either pan the map to your new location or use the search box on the top right. Remember that when searching more information is good, rather than just using “Market Street” something like “Market Street, San Francisco” is always going to give you better results. If you have a browser that supports geolocation such as Firefox 3.6 or if you have Google Gears installed you should see a link marked “Find Me!” at the top right. If you click on that we’ll ask your browser where you are, it should ask for your permission and then we’ll move the map to where you are and show you some places nearby. 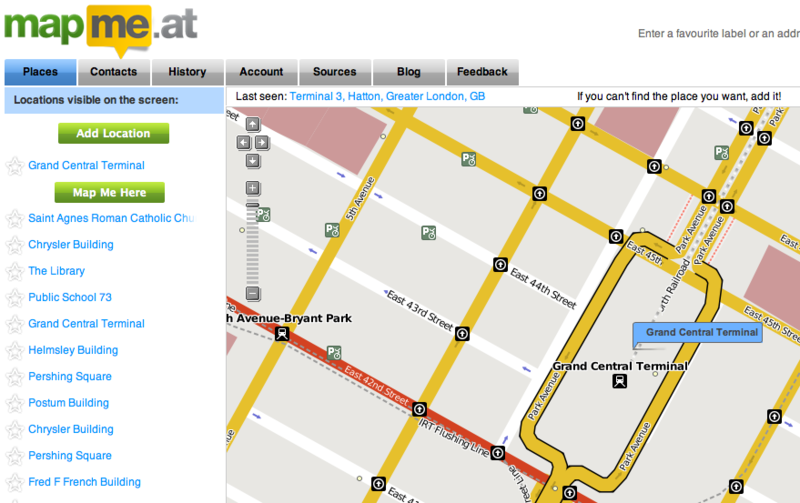 You might notice we’ve added a description of your current location to the top left of the map. This will remind you of where we think you are but you can also click on it if you want to bring the map back to your current location. We source these places from OpenStreetMap, using the fine APIs provided by CloudMade. This gives us a constantly growing database of millions of places across the globe. Even so, nobody’s database is perfect so you might find that the place you’re at isn’t available. 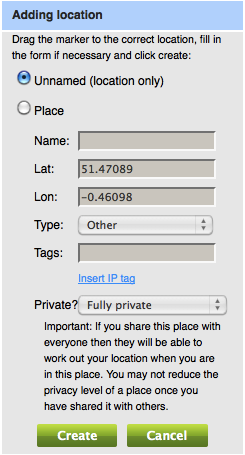 If this happens you can easily create a new place by clicking on the “Add Location” link on your homepage. If you mark the location as “Private” then nobody else will be able to map themselves there - you might like to use this for your home. If you share the location with your contacts then any contact that has full accuracy to view your location will be able to map themselves there. You can also share places with everyone, and if you do this we’ll even push these back into the OpenStreetMap database so everyone benefits! If you’re using our API you’ll find that the methods relating to “favourites” will no longer work. Favourites as they used to work no longer exist on mapme.at. From now on everything will be about places. API methods are in place for accessing places right now though and can be used by simply replacing “favourite” with “place” in the URL. So we really hope you enjoy the new functionality and find it useful. There’s more to come but please feed back to us any comments you have!